Bored of drinking the same plain water, are you one of those people who hate drinking water? With temperatures soaring so high, you should make it a point to drink at least 3 liters of water each day. even if it is not hot , it very important to keep drinking water every hour of the day, and if it is cold water, it is all the more better for cold water helps you in losing weight. You can make your water taste better by adding some of these very common vegetables we often find lying in our fridge, like Cucumber, Lemon, Ginger, Mint, Celery etc. Many weight watchers have been using these vegetables, soaking them in ice cold water and drinking it up. It is a wonderful detox drink too. However, normal people also can benefit from drinking flavored water, as it helps them increase their water intake. You can also add half a lemon's juice. You may lightly crush all these vegetables gently for a more intense flavor. Put all the ingredients into the jar, cover it and leave it in the fridge overnight. In the morning you can start drinking this water, drinking 1-2 glasses of water every hour or as often as you feel like throughout the entire day. The idea is to finish the whole 3 liters of water. You can strain and keep drinking it, for after so many hours, the vegetables if eaten would be pretty flavorless and bland, because all the flavor has gone into the water. You won't believe how addictive this type of water is, you would find yourself easily gulping the whole 3 liters of water without any problem. Imagine how much you would be benefiting by consuming so much water, how your skin, your hair, and your digestive system, your entire body would be glowing. See it for yourself and believe it. Now the same thing can be done adding some crushed fruits to your daily water intake. Note: Sabja Seeds also can be added to the flavored water as it has lot health benefits. Read about the goodness of sabja seeds in the net. In the morning start your day with this lovely, deliciously healthy drink. You can change the fruits according to the availability, like if it is Pears season then go for it, or if you like Pineapple, Water melon or any other fruit for that matter would just be fine. It is your own Sangria of Spain, only thing is it is non- alcoholic, sugar free and salt free. Everything in these type of flavored water is natural. They come with a hole for your straw. So what is stopping you from making these healthy natural drinks? Go ahead and make them and enjoy! Interesting coolers Rama, will surely try these out in a few more months when the mercury soars here. Interesting Coolers Rama, will surely try these out in a few months when the mercury soars here.. Pretty localised ways. aren't they? Will follow your recipe and try some of these, Rama! They look interesting! Lovely summer coolers all, Rama! Lovely! Could definitely beat the heat with these! I cant thank you enough for this recipe Rama, the love behind the sharing was more important to me though, the recipe has changed my daily energy for the better. Where did you get those jars? Yummy! I felt like drinking a glass of that by seeing pictures. The sight of the fresh mint leaves itself is so cooling. Sassy water right? Tried it once and it was very refreshing. 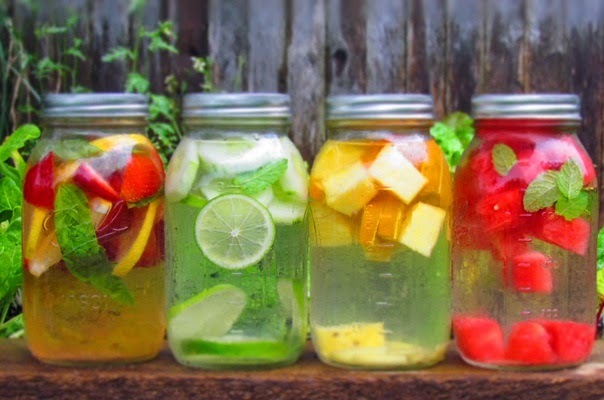 I can do with all these flavored water right now. The mercury here is touching 44 degrees today!! The jars look so pretty! cool:) it is the rage now here in most hyd hotels and is called infused coolers. Thanks everybody for your comments. Asha though I have also seen such coolers with cucumber in 5 star hotels, i never felt like drinking such coolers there, for I had noticed that their cucumbers looked pretty stale and not fresh. Anything homemade is always so much better and tastier. All these look yummy and I'm sure they are healthy too! I wrote the recipes and I will try them. Noe, what do you do, rama, when you are in a travel? Do you still manage to drink the 3 l of liquids/day?